Good photographs can transport you in your mind to the scene they depict. With Photographs of Steam Railways you can journey in your mind back to the days of Steam when the smell of the smoke and the loud sound of the hissing steam often signalled the start of summer holiday trips to the seaside. Photographs of Steam Railways will help you to appreciate the dedication of the enthusiastic volunteers who help to preserve this important part of our British heritage. Steam Engines have a fascination for all, and there has never been so many available to see in the UK since the 1960's. The Churnet Valley Railway near Leek in Staffordshire operates steam engines almost every day and in the first photo we see the Ditcheat Manor ready to leave the station at Consall Forge on its way to Cheddleton. BR tank engine 80098 is ready to leave Cheddleton Station south bound to Froghall in the top picture on page 5. Below we have the 3802 4-4-0 approaching Carrog station on the Llangollen Railway after going round the loop to return to its train. Page 6 has two more photographs of this engine at Carrog station in North Wales on the Llangollen Railway. The top photo on page 7, is again of 3802, this was taken at Llangollen Station. Then we move to Norfolk with a picture of 61572 pulling into Weybourne station. Weybourne station is a deightful country station that has featured in a number of TV productions, the next photo on page 8 was taken from the train looking along the platform. The following picture shows the same engine, 61572 from the road bridge to the west of the station. On page 8 61572 has arrived at Holt station and the final photograph takes us back to the Churnet Valley Railway and is of the first train to leave Froghall on a cold winters morning. Photographs of Steam Railways is a PDF eBook available with 11 high resolution photographic images costing just �5.47 which is less than 50p an image. 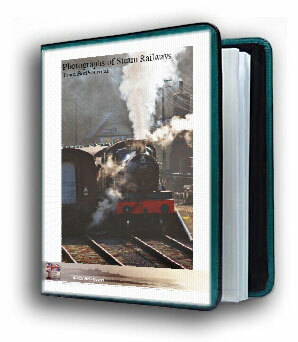 Photographs of Steam Railways is delivered in PDF format and is viewable on any computer. All you need is Adobe Reader which is available free and already on most computers. To print a photograph zoom in to fill the Acrobat Reader window and print current view.